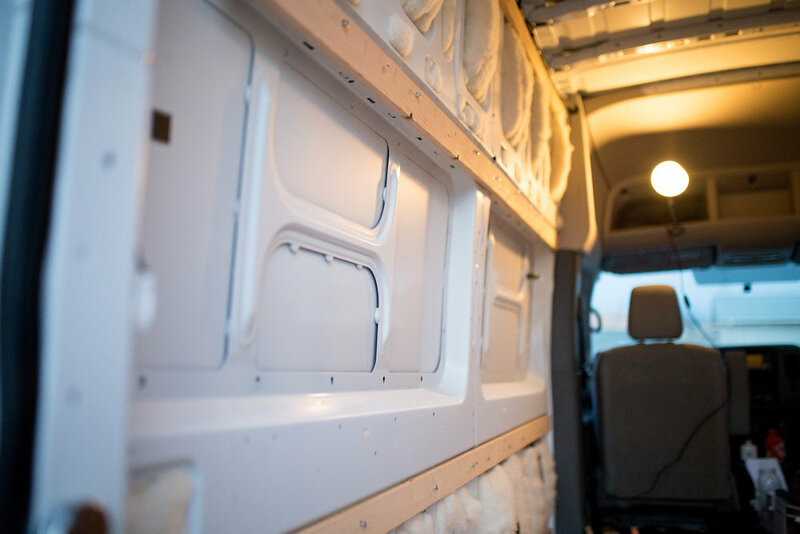 The insulation I chose for the van (aside from the flooring) is Havelock Wool. Ky came across this product after we had already installed the flooring, and we switched to it immediately after reading about how amazing it is. If you want to know more about Havelock, and why I chose to use it, click the button below. Otherwise, scroll down to see how we installed the insulation in Luna. We needed something to hold the wool up on the ceiling so we used this instead of glue. Most adhesives have a terrible odor and are toxic. We wanted to avoid using any unnecessary toxins and any unnecessary waste. This install was SUPER EASY. I mean, less than ten steps, easy. In the spots that had cavities, it was a two-step process. Find or make a cavity, fluff, and stuff. With this wool, we didn’t have to worry about a vapor barrier, its mold resistant, flame resistant, creates a sound barrier, environmentally friendly, and more.